2. Tell us about the most memorable party you've been to.Well, I gave my husband a surprise 50th birthday party/dinner and it was a huge success and came off without a hitch. It is still one of my favorite memories of a party. 4. What do you enjoy most about sunshine? It shining through the windows in our house. Just love to raise the shades or open the drapes and see it peeking in. 5. When you attend a bridal/baby shower, do you prefer to bring your own gift or chip in with others to buy a larger gift? I usually prefer to bring my own gift, but have been know to "chip in." I have definite ideas about gifts and the way they are wrapped, so it's usually best that I "do my own thing." 6. Would you rather have a FREE week of having your house cleaned or all of your meals cooked for you and your family? Oh, meals cooked. I do a pretty good job of keeping our home clean and straight on a day to day basis (since it's usually just Hubby and me) but sometimes I struggle getting motivated to cook. Meals cooked for a week would be "the ultimate." 7. What song describes your mood today? "Celebrate" - just felt extra good today and to me everyday I live is really a reason to celebrate. 8. What is something you received for your own bridal shower/wedding that you still own or use? (If you are not married, feel free to sub a gift you received a long time ago.) How funny, but it is a Corning Ware pie plate. It is not something I use often, but when I bake a pie it is the plate I use. I probably owned it 12-15 years before I ever used it. 9. Your favorite flavor of ice cream is? Plain ole Vanilla. I can add toppings, or various syrups or fruit if I desire, but most often, I just want it plain. 11. "[Fill in the blank] is a food that once I start eating I find really hard to stop." Ruffles potato chips, just love the mix of salt and crunch! 12. " -----" is the best motivation. Well, this is a "toughie" for me, so will ponder it and let you know later..........I have several but not sure which one is the BEST. 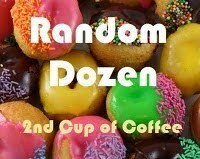 For more Wednesday's Random Dozen check out Linda's Second Cup of Coffee. Hubby and I left on Wednesday, the 12th, headed to Stillwater, OK. (our daughter and family live there) We decided to go to Branson on the way and spend a couple of nights. We have been many times and always enjoy ourselves. We decided to "treat" ourselves and stayed at the lovely Chateau on the Lake. WOW! what a lovely hotel! Hubby sitting patiently while I did a bit of shopping. We enjoyed a couple of shows, ate at some fun restaurants, did a bit of shopping and just enjoyed some "down time." On Friday, the 14th, we headed towards Ok. and we drove most all the way in blinding rain. It was not fun! And, our purpose for going was to assist our daughter and husband in preparations for their move to Louisiana on the 28th of this month. We had reserved a U-Haul trailer and had to pick that up on the way, in Cleveland, OK. U-Hauls were in high demand last week-end and that was the closest one we could find to Stillwater. We had never been to or never heard of, Cleveland, OK. It was only about 6 miles off of our "beating path" so it didn't take a lot of time. I suppose the U-Haul rental place may be the only business in Cleveland. Quite a tiny place. trailer we thought it would be good to split the trip in half. Hubby, daughter and Grandson preparing to load. Our Grandson didn't see anything but fun in this whole process. We arrived home around noon on Monday and our son helped Hubby unload the trailer over at the house our daughter and family will be living in. It is so amazing that it takes hours to load and minutes to unload. We look forward to our daughter and her family living nearby and especially look forward to our Grandson and Granddaughter ( 7 months old) getting to share fun times together. Hopefully it will not be too big of an adjustment for them. They will go from living out on 25 acres to living in a subdivision in the city. 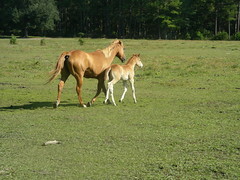 They will pasture their horses at a location about 7 miles from their house here. In time I'm sure they will once again live out and have land with their house to pasture their horses. Our son-in-law has 5 beautiful Quarterhorses and enjoys spending his free time riding and being with them. I have spent the past couple of days getting "back on track" and preparing to have our Grandson with us next week. We will get him on Sunday so that he will miss all the confusion of the move. He is a little sweetheart, but he will keep his Poppa and CiCi very busy and it will not be "business as usual" around our house.~smile~ But, we'll make some precious memories to cherish. In thinking of all that we have going on I can get overwhelmed, but, then I quickly recall the dear friends that we have that would love to be overwhelmed with busyness. Instead, they are fighting the ravages of cancer. I'm so thankful for mine and my husband's good health and just so happy each day to have another chance to live and hopefully make my life count for HIM. It's so good to be back with my Company Girls and for more good blog reading, check it out. Good Morning Company Girls, since this week-end is Mother's Day, I wanted to share a few photos and memories with you of my precious Momma. This will be my second Mother's Day since my Mom's death. I can say that this one will certainly be much easier than last year. As folks told me, the first year will be your hardest and they were so right. 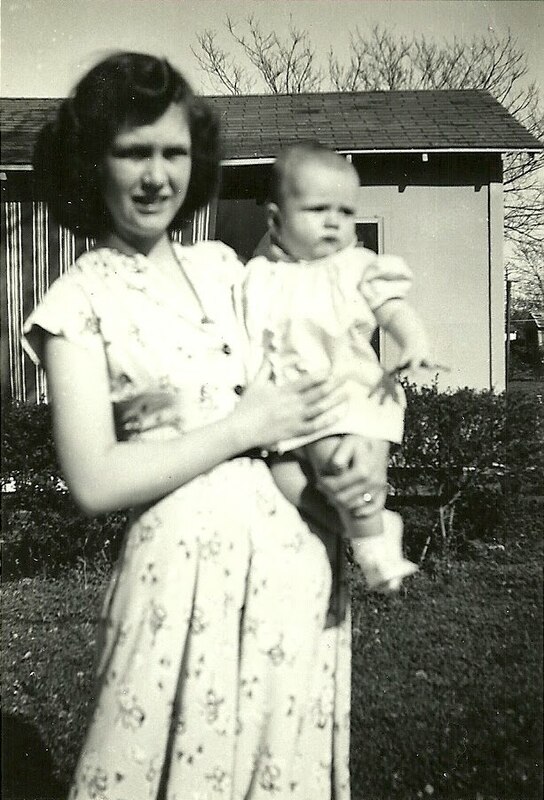 My Mom's death was very sudden and I had no time whatsoever to prepare and it took me most of the first year to accept the fact that she was really gone from this earthly life. 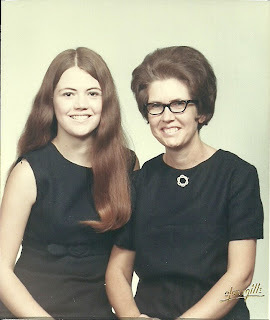 A dear lady told me after Mom died that I would never get over it, but I would get through it. Those were and are such true words. God provided for me just what I needed, when I needed it to bring me through to the other side of my grief. I cannot imagine facing such a loss without HIM. And, having the assurance of reuniting with her one day gives me such peace. It brought back such fond memories as I went throw old photos. 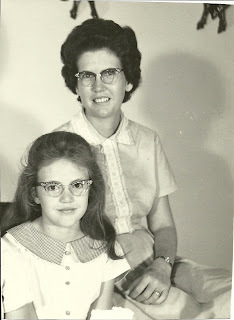 And, of course, it also brought a chuckle or two as I saw how hair and clothes styles had changed over the past 57 years. 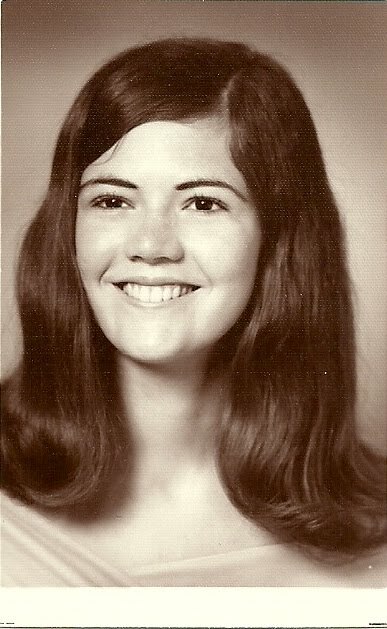 I can remember so well as a little girl thinking that I had the prettiest Momma in all the world. 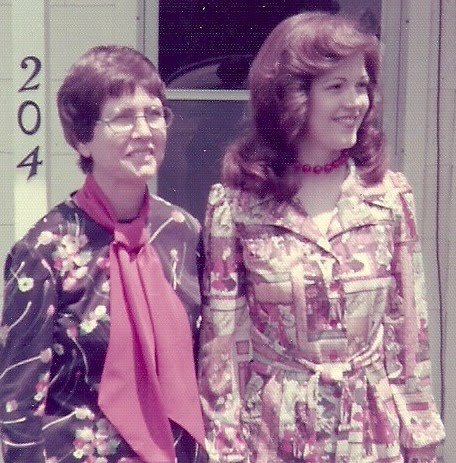 She sewed everything that the two of us wore and I loved everything she made for me and wore it very proudly. And, funny, but I also remember wearing the same dress 2-3 times in the same week and never thinking one thing about it. And, I remember very well owning just one pair of shoes and wearing them until the soles were bare. My, how times have changed! I feel so blessed for the rich heritage my Momma left me. 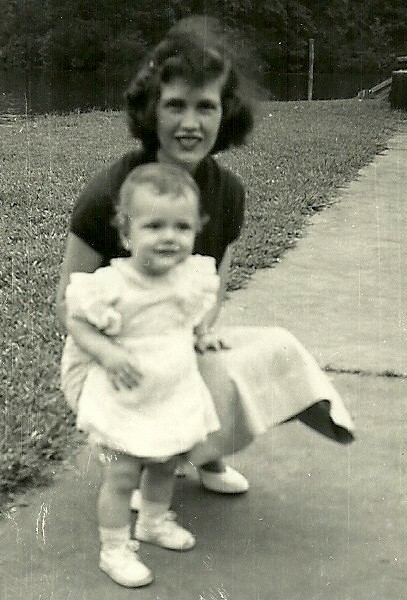 She was such a Godly woman and desired nothing more than to be the wife and Mom that the Lord would have her be. She took her role as homemaker seriously and made our home as much of a sanctuary as she possibly could. She prayed diligently for her children and wanted nothing more for us than God's best. I feel quite certain that her crown is filled with jewels and that upon her arrival to heaven she was met by the Master who likely said, "well done thy good and faithful servant." 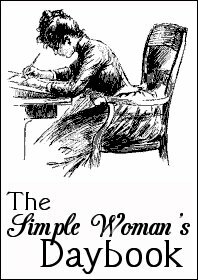 For more Company Girls reading click here. Thanks to Rachel Anne for hosting each week. She's the best! 1. What was the last thing about which you procrastinated? Oh, my, I'm not much of a procrastinator but I have procrastinated calling and checking on a very dear lady in recent days. I'm not usually one to procrastinate on duties that need to be done. I'm all about "getting it done." Just something else I can mark off my list. 2. How long does it take you to fall asleep, and do you sleep through the night? I fall asleep almost as soon as my head hits the pillow and it is a very rare night for me not to sleep the night through and enjoy some really good z-z-z-z-z's. I hope I'm always that fortunate. 3. Which decade would you choose to exemplify your favorite fashion styles? I think the 40's when women dressed with such femininity and class. 4. What is your personal best dish to feed a crowd? I make a really good seafood casserole with shrimp and crayfish and I never fail to get "rave reviews" when I serve it. Of course, this recent oil spill may hinder our ability to get this good seafood here in Louisiana in the coming months. 5. Are you an impulse shopper? What was the last thing you bought on impulse? Well, the hardest thing for me to resist buying is "another" pair of shoes and that was my last impulse purchase. Shame! Shame! 6. What is one wish you have for your own funeral? First, I do not wish to have a traditional funeral, I desire to have a visitation and then a private family burial. And, I do not want my casket open for viewing at the visitation. The only people that need to view my body is my family because that helps with the closure of someone's life. 7. If it's true that joy is in found in the simple things in life, what does your joy look like today? My simple joy today was enjoying a cup of coffee and a piece of strawberry pie with my precious Dad and my step Mom. It was an hour of pure and simple joy. 8. What is your favorite type of bread? The bread that is served at Outback Steakhouse is my all time favorite bread. I think it is called Squaw Bread, but whatever, me likes it! 9. What trait do you fear developing the most? (Laziness, greediness, grumpiness, etc.) WOW! I've never thought about this but it would have to be laziness. I've never been lazy in my life and I don't have a lot of tolerance for it either. 10. What trait would you like most to develop? I've spent way too much time thinking on this, so will take that to mean that there's too many to name or perhaps none. I'll keep pondering this one. 11. Which room in your house best reflects your personality? Why? Oh, my kitchen most definitely!!! I began collecting roosters several years ago because they are so colorful and have such personalities and remind me of myself a bit. ~smile~ I also have a collection of crosses made from all types of materials and they always remind me of the ONE who gives me life eternal. And, I have a cuckoo clock that puts a smile on my face every time he announces the time. Below are two pictures (sorry,their not the best quality) from my "personality filled" kitchen. 12. How do you maintain balance in your life regarding, work, family, church, other organizations and activities, and blogging? I have always tried to live with God first, family second and my interests third. I wish I could say that I have always succeeded, but that would be a lie. But, I am certainly conscious when I get things out of order and I'm a firm believer that a balanced life is a productive and happier life. For more interesting answers check out Linda's Random Dozen. Outside my window............Rhett and Rosco (our labs) are doing their most favorite thing, chasing squirrels. They will sit at the bottom of a tree for hours just waiting on one of those pesky squirrels to come down so that they can take off after them. Quite entertaining! Two spoiled dogs! I am thinking.........that some things just aren't worth the effort and that some things are worth more than the effort. I am thankful for...........a husband that is quite the handyman. About the only thing that he doesn't tackle is plumbing issues. In recent days he's been replacing 4 of our light fixtures with new ones. And, he's a perfectionist about everything that he does. I am blessed for sure! From the kitchen......it's going to be grilled burgers tonight. I know they are so easy, but we do love them and we eat our fair share of them in the spring and summer. It's also time to make a fresh batch of Bran Muffins as I ate my last one this morning, so that will be on my list for this afternoon too. I am wearing.........a tee shirt and capri pajama pants but will be getting dressed shortly. I am reading...........Her Mother's Hope by Francine Rivers and it is just as wonderful as the rest of her books and I understand a sequel to this book will be out in the fall. I am hoping............that our daughter, her husband and our precious Grandson will have safe travels as they come to see us from Oklahoma tomorrow. I am hearing..........."Dancing with the Stars" on the TV and the clicking of the keys on my laptop. Around the house............the ironing is done and I will be "readying" things for daughter and family's arrival tomorrow. One of my favorite things............is visiting with my precious Vietnamese friend while she does my nails. Ami has been doing my nails for about 7 years and we have become very dear friends during that time. She and her husband own the Nail Salon and are two of the hardest working people I have ever known. It has been so neat to get to know them and their two adorable children. A few plans for the rest of the week............spending time with our daughter and her family. I can't wait to see our 19 month old Grandson and see all that he has learned since we last saw him about 6 weeks ago. He is so full of personality and just a delight to be around.